You are at:Home»Herbs»Adhatoda vasica Nees. Latin name : Adhatoda vasica Nees. Recommended Dosage : 3 to 6 g powder of leaves. 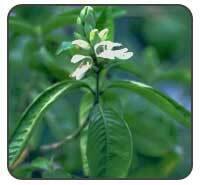 Contraindication : This herb is contraindicated during pregnancy (as it except during labour. Many times the recommended dose can cause severe vomiting.